I'll use this photo again because it is relevant to what I am about to say. Over the past few days I gradually slipped into a low energy state, questioning myself, my point, my path, my purpose ... etc etc bla bla bla dee da. Life. In all, I was feeling lost, confused, indecisive, miserable and purposeless. I think it started happening here ... But then again, as I've come to learn, this kind of mood predates an important shift (inner and/or outer) and new realisations ... as the Self struggles to make sense of and embrace the unknown (what is being given) whilst letting of the known (what is being released). It involves patience. Anyway, in the midst of my malaise, the KC image featured above kept popping into my head. 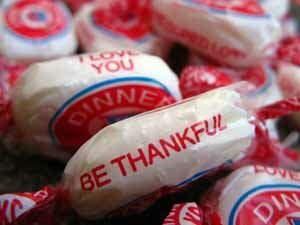 Because of the positioning of the mints, it looked to me as though the message was saying: "I love you. Be thankful." It struck me as a message from God/The Universe ... and, whilst I understood what it was saying, my low energy mood did not enable me to fully absorb it. So, even though it kept flashing in my mind's eye, I kept ignoring it. I love you. Be thankful. You are as you are because that is who you are meant to be. You are where you are because that is where you are meant to be. You do what you do because that is what you are to do in the way that only you can do it. And that goes for you too. A message of trust from the KC Oracle.